By Mike Smith: Two days after winning he vacant WBC welterweight title in beating Danny Garcia by a 12 round unanimous decision in Brooklyn, New York, Shawn Porter says he’s ready to face undefeated International Boxing Federation welterweight champion Errol Spence Jr. in a unification fight next and beat him. Porter (29-2-1, 17 KOs) says the Spence (24-0, 21 KOs) fight is the one that should take place next for him. However, Porter says it’s going to come down to the business as to whether the fight with Errol takes place or not at the end of the year. Porter, 30, states that if another fight offer is there, then that could be the direction he goes in. Porter isn’t saying what that fight would be, but obviously names like Manny Pacquiao, Amir Khan and Keith Thurman come to mind as potential ones that could get in the way of a Porter-Spence unification match in 2018. Porter beat Danny Garcia (34-2, 20 KOs) by a 12 round unanimous decision last Saturday night at the Barclays Center by the scores 116-112, 115-113 and 115-113. It was a close enough fight to where many boxing fans thought that Garcia should have had his hand raised at the end. To be sure, Porter’s face was badly marked up at the end of the match, and he had been hit by the harder, cleaner-landing shots in every round of the fight. If the judges had scored the fight based on which fighter had landed the better shots during the 12 rounds, it’s an easy decision to pick Garcia as the winner, as he was the better of the two fighters as far as landing the harder shots. ”We shall see. That’s the fight that should be next for him and I,” Porter said to Fighthub about a fight between him and Spence. ”I think the fight makes sense to do it now. There could be something else that could come up. We shall see, but I firmly believe that should be the next fight for me and that should be the next fight for him. 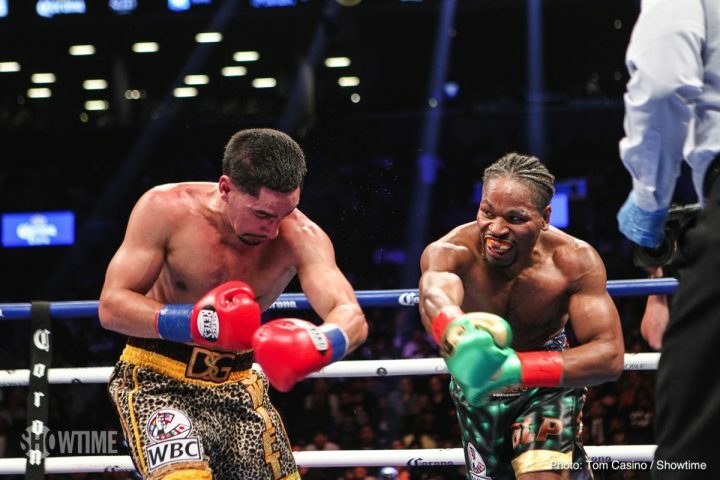 Shawn Porter is victorious, unified champion,” Porter said in predicting a victory over Spence. It’s unlikely that Porter will get any of the bigger names to fight him before the end of the year. Thurman is expected to take a tune-up fight in November or December. He’s not going to want to fight Porter in a rematch in his first fight back from a 1 ½ year layoff. Amir Khan wants Pacquiao in the UK. There’s a lot of money to be made by Khan in a fight with Pacquiao. If Khan doesn’t fight Pacquiao, then he’ll likely battle former IBF welterweight champion Kell Brook. A rematch against Garcia, of course, is a possibility for Porter if he wants that fight and if there’s enough interest from the boxing public in seeing the two do it again. It would be better for the two of them to go in different directions right now rather than subjecting the fans to a recycled fight. Spence wants the Porter fight next. He sees it as a tune-up to get him ready for a match against Thurman in 2019. Spence needs a big fight to help build his career, as his last one against Carlos Ocampo was a mismatch with him destroying the little known fighter by a 1st round knockout. “I remember seeing him bleeding at the end of the 1st round and I was thinking, ‘this is mine,’” Porter said about his fight against Danny Garcia last Saturday. Garcia gassed out in the second half of the fight and was at the mercy of the stronger Porter. Garcia continued to land the harder shots, but he didn’t have the energy to match the work rate and the movement from Porter. That’s what the fight came down to. The work rate and the activity level of Porter out-shining the occasional big shots that Garcia was landing in the fight. It’s going to be a lot harder fight for Porter against Spence than what we saw in his last fight against Garcia. Spence is capable of throwing a lot of heavy shots in close, and he’s not someone that is going to disappear when Porter comes in close to brawl. Garcia looked helpless against Porter on the inside last Saturday night. The only thing Garcia seemed capable of doing was clinching Porter to try and neutralize his inside game. Spence will be a completely different fighter when Porter comes in close. Spence is used to sparring with 6’0” WBC junior middleweight champion Jermell Charlo, and he’ll be right at home using his size advantage to dominate the shorter, smaller 5’7” Porter on the inside. It could be a blowout victory for Spence if Porter doesn’t adapt by staying on the outside out or range. ”One of the things that is special about Shawn is he has the ability to be so versatile, especially when you’re talking about a guy that is only 5’7”. If you go back and look at his reach, his reach was an inch and a half longer than Danny’s tonight,” Kenny said. Shawn did looked versatile against Garcia, but he wasn’t effective when he was boxing him. The thing that worked for Porter is when he went back to his brawling style of fighting and took the fight to the inside. Garcia was worn down by Porter’s in fighting. It’s not surprising that Porter was able to get the better of Garcia in close, because Lamont Peterson and Mauricio Herrera had already shown in the past that Danny is very susceptible to pressure and inside mauling. What’s surprising is Porter tried to box in the first four rounds against Garcia instead of sticking to the existing blueprint to defeat him. Porter’s slow start to the fight ultimately made it a closer one than it should have been. Porter and his trainers are going to need to be smarter for the Spence fight if they want to win, because they can’t give up the first four rounds against a talented fighter like him and expect to rally to get a decision. That’s not going to happen. If Spence sweeps the first four rounds, then Porter can forget about beating him. It won’t happen. “A lot of people don’t know that. His footwork and his ability to be in one place and then another place creates problems for whoever he’s fighting,” Kenny said. ”So a guy like Errol Spence, who is used to coming forward in a straight line, you’re going to have to get out of that comfort zone to get to Shawn, and then he’ll change directions on you. I expect Shawn to be even better in the next one. With these guys and Shawn doing what he’s supposed to do, I believe the sky’s the limit and he can unify these titles,” Kenny Porter said.